You are surrounded by the sounds of wild animals like alligators, elephants, and tigers, oh my! Eating at the Rainforest Café Restaurant is an adventure for the family. You are a safari guide that guides children and parents to their tables. Want to discover a fun place to work? Then pick up a Rainforest Café Application today. Children are delighted by the ceilings with fiber optic stars and dazzled by the animatronic tigers, gorillas, and elephants. Guests are seated by Tour Guides and waited on by Safari guides. The brilliantly themed restaurant was dreamed up by entrepreneur Steven Schussler. The rainforest themed restaurant opened in the Mall of America in Bloomington, Minnesota on Feb. 3, 1994. Families can now enjoy over 32 different locations across America. They can enjoy rooms partitioned off by curtains of rain. Children can explore the gift shop and purchase stuffed rainforest creatures. In 2000, the Rainforest Café was bought by Landry’s Inc. of Houston, Texas. Landry’s Inc. is known for restaurants such as Landry’s Seafood House, Claim Jumper, and The Chart House. For children, the cafe can be a learning experience while they are having fun. All restaurants have “Tracy the Talking Tree” which educates customers about fragile ecosystems and conservation efforts to save the rainforest. The café offers classroom lesson plans, educational tours, and fundraising opportunities. They also have an Excellence in Education Program. If you are on a career path in the restaurant industry, then Rainforest Café Careers is just the place to begin by filling out a Rainforest Café application. If you have previous managerial experience or customer service, there are job opportunities in management. You can find a position as General Manger, Front of the House Restaurant Manager, Retail Manager, Kitchen Manager, and Executive Chef. For Rainforest Café Jobs, you can apply online for employment. Entry-level positions are Tour Guide or host, Safari Guide or server, Pathfinders or sales clerks, Safari Assistants or bussers, and Trailblazers or kitchen staff. The restaurant also serves alcohol, and you can find a position as a Navigator or bartender. How old do you have to be to work at Rainforest Café? The minimum age to work for the restaurant is 17 years old. However, when filling out a direct application, you can ask the hiring manager what the age requirement is for the job. Some Rainforest Café jobs serve alcohol, and you will need to be 21 years of age. Benefits for entry-level positions offer flexible scheduling for those who need a varied schedule. They have a competitive wages and salary options for their employees, meal discounts, and uniforms are free or at a discounted rate. Eligible employees can receive health benefits, life insurance, and 401 (k) retirement plans. Hours of operation for the restaurant are Monday through Thursday 10:00 am to 9:30 pm, Friday 10:00 am to 10:30 pm, Saturday 10:00 am to 11:00 pm and Sunday 10:00 am to 9:00 pm. If you are interested in working for the café, then you will need to have a flexible schedule. Your schedule could include evenings, weekends, and holidays. 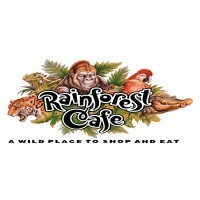 Sales Associates or Pathfinders-The café offers a gift shop for patrons with rainforest themed products. As a sales associate, you will be stocking shelves, making sales transactions, assisting customers with any products for sales, and maintaining inventory. Part of your job responsibilities will be to keep the store presentable. Your wage will be anywhere from $9.00 an hour to $10.00 an hour. Server or Safari Guide-Your responsibilities will include preparing the room for restaurant guests by putting tablecloths on tables, setting placements, and vacuuming floors. You will help guests select food items on the menu, make suggestions, and take orders. You will maintain the table such as clearing off the table and refreshing drinks during the course of the meal. Your wage as server will be $2.00 to $3.00 an hour plus tips. Host or Trail Guide- As a host, your job will be to cheerfully great guests, guide them to their seating, make them comfortable, and offer any drinks while they wait for their server. You will be answering the phone for inquiries and making reservations. Your wage as host will be $9.00 an hour to $10.00 an hour. Restaurant Manager-Your job description is to provide an example of excellent customer service, meet financial objectives of the restaurant, hire, train and coach staff. You will maintain a safe and healthy environment for patrons, publicize the restaurant, hold events, advertise, and plan menus with the executive chef. You will uphold the procedure and policies of the company. Your salary will be around $50,000. When considering Rainforest jobs online, you should start thinking about the interview. Unfortunately, there is not a printable application form for jobs. Why do you want to work for Rainforest Café? The Rainforest Café is a fast-paced, themed restaurant for families. Research the company, dine at the restaurant, and then write down your reasons for why you want to work at this particular place. Tell me about a time you made a mistake. This is a customer service industry, and they will ask to what kind of mistakes you make, how you corrected the mistakes, and ultimately how you turned it around for the guest. Tell me about a time where you have excellent customer service? This is your chance to show them your customer experience skills by telling them your proudest moment when you helped a guest. What do you think are the most important qualities in server? Create a script for yourself and write down the qualities for this job. How would you deal with a demanding customer? Write down how you have handled a demanding customer in the past, what did you do to make that customer happy. Did you listen and repeat back his complaint, how did you resolve the complaint? What are your career goals and how long do you plan on staying? Rainforest café is known for keeping people within the company. You are an investment financially and in time. They will look for someone who wants to stay and grow within the company. How to apply for Rainforest Café online? You will apply for jobs at Rainforest Café at their careers link found below. The link will direct you to Landry’s Inc., their parent company, and you will click on the careers box located at the top of the page. Then you will pick the category of job that fits your qualifications. Unfortunately, there is not a printable application for Rainforest Café or download application form. They have a separate link for management positions. You will click on the link for management opportunities then select city and Rainforest Café Restaurant. After that, you will proceed to fill out an email registration form with your current information and upload your resume. You can also use a social media account to pre-fill in the application form. For entry-level positions, you will click on the restaurant and hospitality staff positions. It will take you to a restaurant staff inquiry form, and you will fill out some contact and employment information. It is not an online application but merely an inquiry form. They will contact you for any positions in your local area or fill out a free application directly with the restaurant. If you love people and thrive in an energetic and exciting environment, then the café is the perfect place for you to interview for a job. They see many applications for positions, so exude confidence and a positive attitude in your interview. Come dressed professionally for the job. Expect a one-to-one interview as well as panel discussions and group meetings. Sweet Tomatoes: Checkout the application page for work at Sweet Tomatoes. Fogo De Chao: For employment at Fogo De Chao visit the application page. Five Guys Burgers And Fries: For employment at Five Guys Burgers And Fries visit the application page. Islands Fine Burgers: See our resource page for more information on Islands Fine Burgers careers. Beef ‘O’ Brady’s: For career opportunities, fill out the Beef ‘O’ Brady’s online application.